That’s the most common response when I reveal that I bake bread. Though I do have a bread machine, I seldom use it any more. For many, though, the limitation to making bread is the absence of an functional oven (I have heard anecdotes of ovens being used exclusively to store kitchen paraphernalia). In many parts of the world, owning an oven is a luxury - but that does not exclude one from exploring the range of flatbreads. 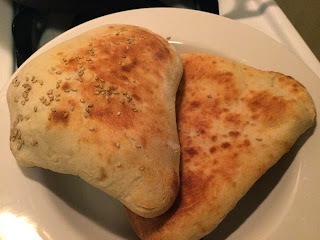 Flatbreads can run the gamut, from pancake-like injera native to Ethiopia, to large towel-sized lavash of Armenia, but the main point is the breads did not need the enclosed space of an oven to be baked. In fact, one could easily make naan or pita bread at home with little more than a broiler or even just the gas stove top and a concave pan. Physically speaking, naan and pita are very similar; the key differences are mostly cultural. Naan often incorporated ghee and yogurt for flavor. And both are subject to numerous variations depending on the situations. I have found, though, that one should start with a high hydration dough, about 50%. Regular all purpose flour will work just fine. Resting the dough is important to allow the gluten to form. While it's possible to do a chemical leavening (i.e., yeast-free naan), the required rest period means there’s little convenience in using chemical leavening. I advocate the use of yeast not just for the rise, but also the flavor. After the first rise (which isn’t strict - I usually allow for 8 hours), a second rise isn’t necessary. Scrape out the dough onto a working surface, dust with flour, divide into portions, and roll into spheres. 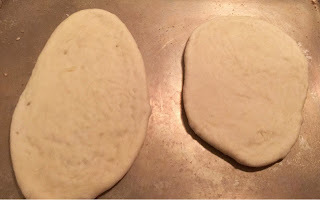 Flatten out the dough with some kind of frissage - resulting in oblong flat shapes. Lay on a greased pan, and put under a hot broiler for 1-3 minutes, and flip over for another minute. Yes, it’s that fast. When is an experiment not an experiment?